The term media server often conjures images of expensive and difficult-to-use products. In reality, the opposite is true. Today we'll talk about a few choice products, what the difference between a streamer and a server is, and how you can build your own solution from off-the-shelf parts. I've been enjoying my Daedalus 2.1 speakers in my stereo setup ever since I reviewed and bought them in 2008. High Frame Rate (HFR) seems to be the new buzzword in movie production, these days, at least to some directors who are experimenting with it. Editorial: The Industry Learns a Lesson: The Death of 3D vs. Industry Predictions. Will this Change their Plans for Introducing 4K to the Public? The recent announcement that ESPN is eliminating its 3D channel on cable and satellite tells a sad story of overestimating the impact of 3D on selling more HDTVs. Although 3D movies continue to be released - for the time being - it appears that consumers are not interested in watching 3D at home. The "glasses" are claimed to be the scapegoat, but I think there is more to it than that. 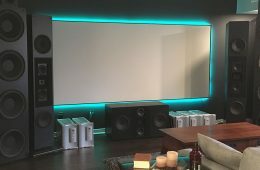 For those of us who enjoy two-channel (stereo) audio using a high-end system, but also like our home theater with surround sound, how to integrate the two setups without compromising the stereo high-end system has been a conundrum. In this article, I will show you how to have both systems interconnected, but not compromise the sound when you want to listen to your stereo CDs, or SACD in stereo. It is useful to have the Blu-ray player read downloaded MP3, FLAC, and WAV files off a memory stick. If the player is well designed, the MP3 files should display information on the work and the performer on the TV screen. FLAC files encoded at sampling rates of 96kHz, or a sampling rate or 192kHz, should be bit-accurate at the both the S/PDIF or HDMI outputs. Be careful; many Blu-ray players do not support FLAC data files. Most Blu-ray players USB ports will also work with Hard Drives. Another option on many Blu-ray players is to find music across a computer network if you establish an Ethernet connection for the Blu-ray player to your computer router. Special software must be resident on the computers. How to do this is way out of the scope of this article. It is not practical to connect your Universal Blu-ray Player to your AVR using an analog connection if you want to listen in multichannel. For similar reasons you should accept that the multichannel DSD data off an SACD is going to have to be transcoded at some point to LPCM. S/PDIF is also not a connection option in multichannel. Conceptually, multichannel audio makes abundant sense. Practically, however, it has failed with a critical mass of listeners. Quadrasonic sound, circa 1971, was the first setback. While modern analysis of optimal multichannel reproduction now reveals the unfavorable placement of the rear channels, its primary undoing was the intractable challenge of lifting four high-quality discrete channels off a vinyl record. Ten years ago, the industry tried again with optical disc media. A format war, coupled with the need for special equipment, resulted in little consumer interest, which was already a crowded space with the advent of home theater and portable MP3 players. The Blu-ray audio disc is the new promising third iteration owing to its seamless compatibility with home theater installations. The audiophile and videophile have not merged into one species........This three-part series outlines the general concepts of an audiophile-friendly third-generation multichannel audio system. Although SACDs and DVD-As have not succeeded as much as music studios had thought, and audiophiles had hoped, they are still being released in small quantities, particularly by independent labels. However, there is another alternative, which is downloading the high rez albums if they are not available commercially on discs in stores. I received an interesting e-mail today, from a reader who was concerned about all the movies that have been released over the past few years with little to no color in the image. I have been planning to write an editorial about why I think young consumers are into MP3 music and don't really care about the high quality of lossless digital music that the rest of us have been trying to get them to switch over to, or at least give it a listen. I recently had the pleasure of catching this movie in IMAX 3D, and then later in Dolby 3D. I have not seen this film in a regular theater setting, but then the "buzz" around this film is all about the 3D. One of our SECRETS team has commented on the current film along with his review of the vintage Alice films in the April, 2010 Movie Reviews.